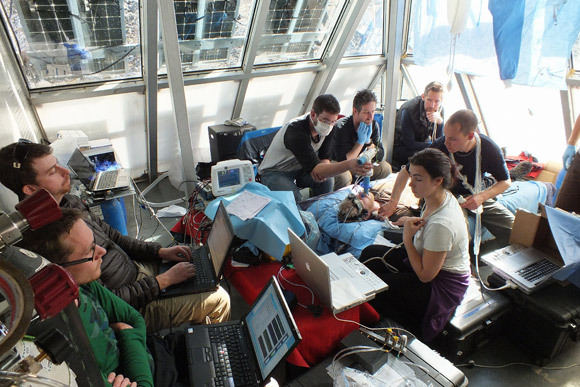 Team members of Everest 2012: UBC’s International Research Expedition, conduct one of their human health experiments at Mount Everest’s Pyramid Lab. Tickets are now available for the eighth annual Valley First/UBC Okanagan Scholarship Breakfast, which will feature members of UBC’s Everest 2012 international research expedition. The popular fundraiser will be held at the Capri Hotel on Friday April 5. A panel of human physiology researchers will discuss their experiences. Last spring, UBC’s Okanagan campus Faculty of Health and Social Development led a six-country, eight-university team of 30 scientists and students to the Pyramid Lab at an altitude of 5,500 metres near base camp of Mount Everest. Their pioneering research explored human health effects of high-altitude changes in blood flow and chronic oxygen deprivation. The symptoms mimic those of people suffering from respiratory and heart health issues, as well as stroke survivors. 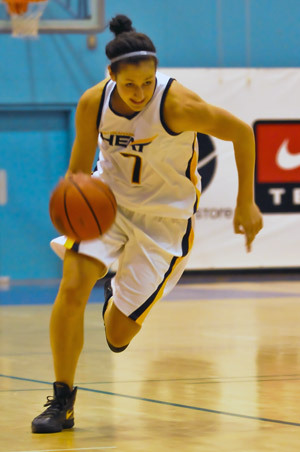 Roslyn Huber, a member of the UBC Heat Women’s Basketball team, will also speak at the event. Huber, a 2008 graduate of Rutland Senior Secondary School, is a fifth-year human kinetics student from Kelowna. Huber led the team in scoring last year. At the half-way point of her final season, Huber has cemented her status as one of the top all-time players at UBC’s Okanagan campus. She currently ranks second in the school’s all-time scoring with 796 points, only 65 points away from breaking the record. UBC’s Okanagan campus men’s and women’s basketball and volleyball teams are in their second year of Canadian Interuniversity Sport (CIS) competition while men’s and women’s soccer and golf continue to compete in the Canadian Collegiate Athletic Association (CCAA). Sports are an integral part of university life and UBC is committed to developing competitive teams, athletes and scholars, says Rob Johnson, director of Athletics and Recreation. “Many of our student athletes couldn’t afford to participate without the financial awards that we can offer as a result of proceeds from the Athletics Breakfast,” says Johnson. With a dedication to full-time academic pursuits as well as team play, student athletes devote countless hours to competition, training and practice, says Johnson. Recognizing varsity sport as a valuable component of the educational process, UBC matches every dollar raised by the Valley First/UBC Okanagan Athletics Breakfast. More than $350,000 has been raised to date from the annual event. As a result, $7,500 in awards is available to student athletes this year. For more event information or further details about Heat Athletics, please go to www.goheat.ca or call 250-807-9168.